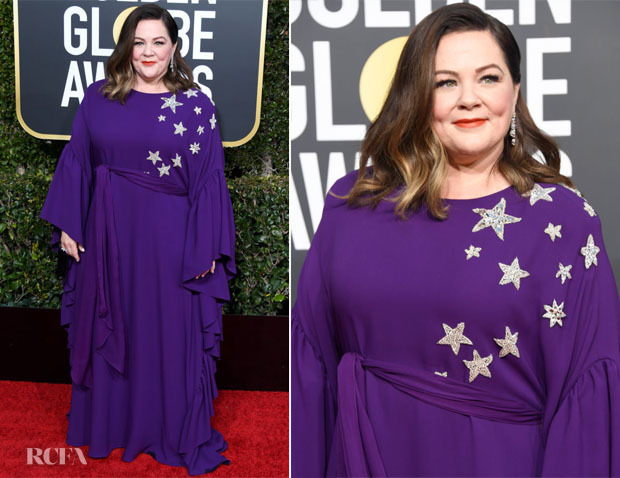 Melissa McCarthy was among the nominees tonight at the 2019 Golden Globe Awards on Sunday (January 6) in Beverly Hills, California. The ‘Can You Ever Forgive Me’ actress dazzled in a Reem Acra Fall 2018 gown that was star-studded — literally. There was such an effortlessly relaxed, almost boho, spirit to this dress. But, the brilliant purple hue was the real star of the show — especially when paired with her hot-coral lip. Chopard jewels completed the look.